Designed to deliver essential data center services with commodity off-the-shelf IT resources, SUSE Linux Enterprise Server is a versatile Linux platform that pleases both business users and IT managers.SUSE Linux Enterprise Server for SAP Applications delivers outstanding uptime and performance, even under full CPU loads and high memory stress. It offers integrated priority support and maintenance from both SUSE and SAP through the SAP Solution Manager.SUSE Linux Enterprise Server for SAP Applications includes high-availability components that help build SAP clustering solutions for physical and virtual Linux deployments. It is designed to enable deployment in hours instead of days. 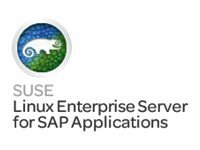 SUSE Linux Enterprise Server for SAP Applications is the only operating system that provides an automated, end-to-end installation workflow, including the SAP applications.